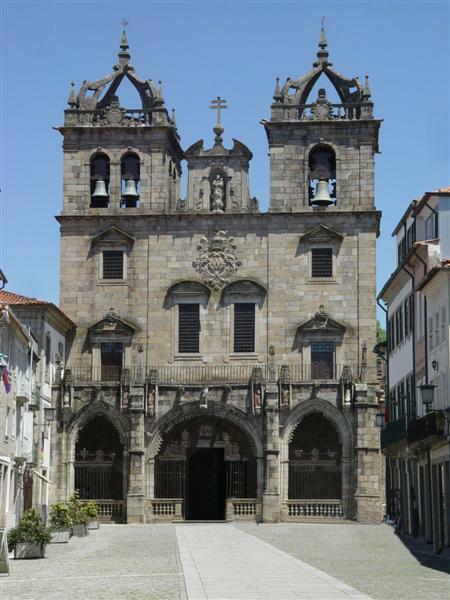 The ancient city of Braga is a very unique part of Portugal with a storied religious history. It is officially Portugal’s oldest city and its history means there is plenty to explore for tourists. So, without further ado, let’s have a look at some of the most unique places to visit in Braga. Braga’s historical centrepiece is the Praça da República. It has some of the city’s oldest and most respected landmarks in the whole country like the Igreja da Lapa cathedral, the Vianna fountain, and Braga Castle’s the Torre de Menagem. Another interesting and storied region is the Arcada, which is located in the city’s commercial plaza on the west side of the square. The best way to enjoy this part of the city is by walking around and cafe hopping, especially if you love your coffee. Braga has a vibrant cafe culture, and there are lots of establishments to explore. One worth mentioning is Vianna Café, which was established in 1858 and is the oldest cafe in the city. The Braga Cathedral is certainly a must-see, as it is the oldest cathedral in Braga, dating as far back as the 3rd century AD. Designed in an eclectic mixture of Romanesque, Manueline, Gothic, Baroque, and Renaissance styles, the church’s facade is a visual treat. As you enter the building, you’ll be greeted by the spectacular main chapel, which is decorated with stone rib vaulting and Christian figures. The high choir near the entrance has a painted ceiling and two gigantic organs decorated with impressive fantastical and baroque motifs. There are lots of other artefacts and tombs, to explore in the cathedral. There is even a naturally mummified body on display, as well as several tombs and cloisters, most notably the Chapel of the Glory, which is guarded by six stone lions and decorated with resplendent images of the apostles. If you’re visiting Braga during the spring or summer months, you’ll get to see the Garden of Santa Barbara in full bloom. This garden in the civil parish of Sé and consists of boxwood hedges with geometric designs and cedar topiaries. Going further into the garden, you will see a plethora of plants and flowers that will overwhelm the senses. The ruins of a Gothic arcade border the garden, while a statue of Saint Barbara, the garden’s patron saint, stands in the middle. There is a strange charm in the contrast between the flowers and historic remains of the ruined medieval palace. The Portuguese love their football and it is a big part of their local culture. Nothing represents their love for the sport more than the Estadio Municipal de Braga. 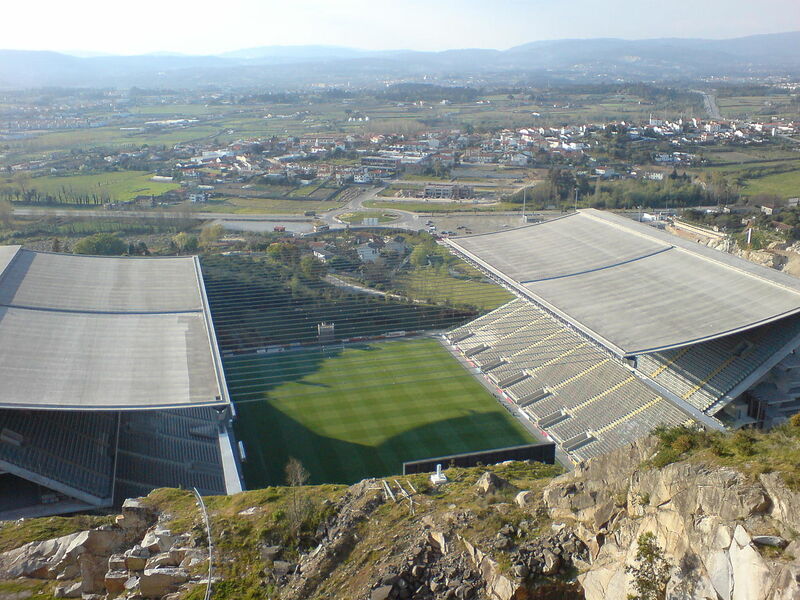 The Estadio Municipal de Braga is one of the most unique stadiums in the world, and is also referred to as A Pedreira (The Quarry ). It was carved into the face of the Monte do Castro quarry, and is home to top tier side S.C. Braga. Behind one of the goals is a rock face where a scoreboard is hung, which means there are only three stands. The stadium’s two stands either side of the rock face are connected by steel cables, which is a reference to South American Incan bridges. There is also a 5000-square meter subterranean plaza right under the stadium. Probably the most popular destination in Braga, this sanctuary sits on a hill about 381 feet above sea level. The sanctuary can be accessed by car, but pilgrims generally choose the 116-metre zigzag stairway. Dating as far back as 1373 and possibly older, visitors flock to the sanctuary for its breathtaking views of the city and the beautiful baroque fountains. Want to learn about more fabulous places to visit? Check out our post on the best restaurants to try in Bangalore. Also, don’t forget to follow us on social media.